The PMS/CRS integration is one of the most important, yet probably the most frustrating for hoteliers the world over. In a special webinar with our friends from AAHOA, we set out to clear up some of the most common misconceptions and answer your questions on optimizing the crucial PMS/CRS relationship. The following are highlights, so be sure to check out the recording to get the full story! Seeing where the PMS sits in the distribution landscape will help you better understand the importance of mastering this integration. Let’s say your PMS and CRS aren’t integrated because it’s too costly for you. That means you have to maintain inventory in both systems manually, which can cause you to miss bookings if the inventory is not constantly balanced. Guest information will drop at some point, and you may also lose your chance to market to guests effectively. Or if you do have an integration, i.e., you hold back rooms in the PMS to handle overbookings. This can prevent you from capitalizing on all of your assets, and you may end up losing potential guests anyway. The PMS/CRS integration plays a key role in your technology puzzle by helping to prevent these losses and create new avenues for revenue. Now let’s discuss the various communication levels of integrations. You have a basic 1-way, which sends data in one direction. That could be only reservations from the CRS to the PMS. There aren’t many of these on the market as they don’t provide much benefit. It’s often confused with a 1.5-way interface. This type represents the majority of interfaces on the market. 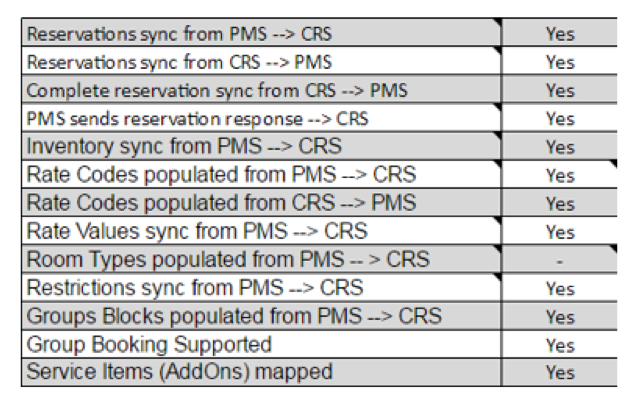 The 1.5-way means that availability, rates, and inventory are sent from the PMS, and reservations are sent from the CRS. However, it really only provides the basics, maybe with some additional features. Then you have the full 2-way connection. These connections are the most robust because they offer the most optimization and benefits. Some examples of preferable 2-way features include reservations both ways and full integration of group blocks and add-ons. The 2-way interface is your ideal integration format, and the most robust as seen in our diagram. Get Involved -- Your Checklist! Our audience had some great live questions. Here are three that we found particularly interesting. #1 - If we don't want to delete codes, how do we clean things up? It depends on your PMS. If you can hold specific rates codes back, you can clean with confidence. If that’s not allowed, you’ll have to wait for the reservations to go through first. Also, consider re-using rate codes to keep things moving faster. The more codes you have, the more bogged down the system tends to get. #2 - What's the biggest mistake hoteliers make concerning the PMS/CRS connection? Not considering the whole integration, and not asking enough questions about different facets. You may not be a “technical” person at your hotel, but you need to know technical things, especially like what restrictions flow through the interface. #3 - What should we independent hoteliers be looking for in our PMS/CRS? Find a reasonable PMS or CRS that doesn’t cost too much and has a decent integration. You want to have at least a 1.5-way connection. That’s a must-have. If you have a lot of groups, though, you will need to see if group blocks are supported. Same with add-ons to save time not having to do manual entries.